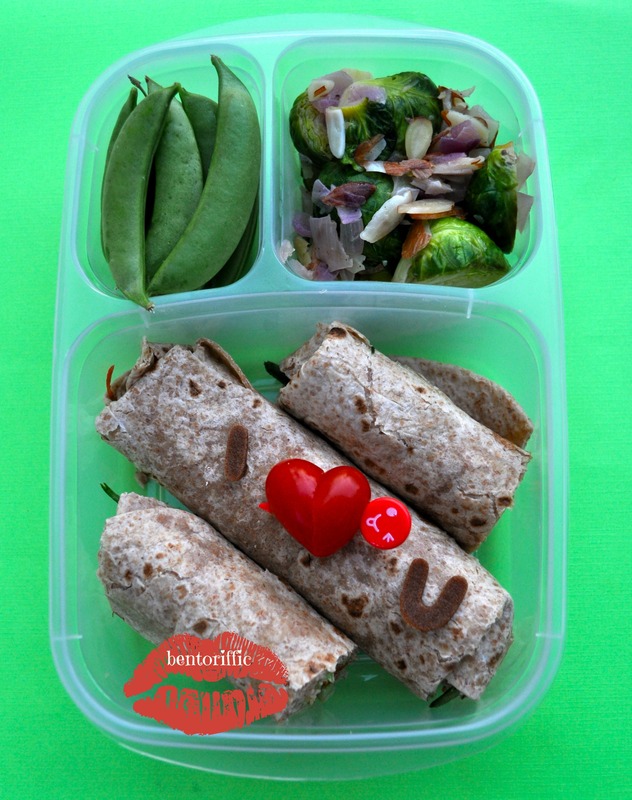 I already know that tomorrow’s going to be an insanely busy day so I’m posting 2 lunches I did long ago before my blogging universe began. 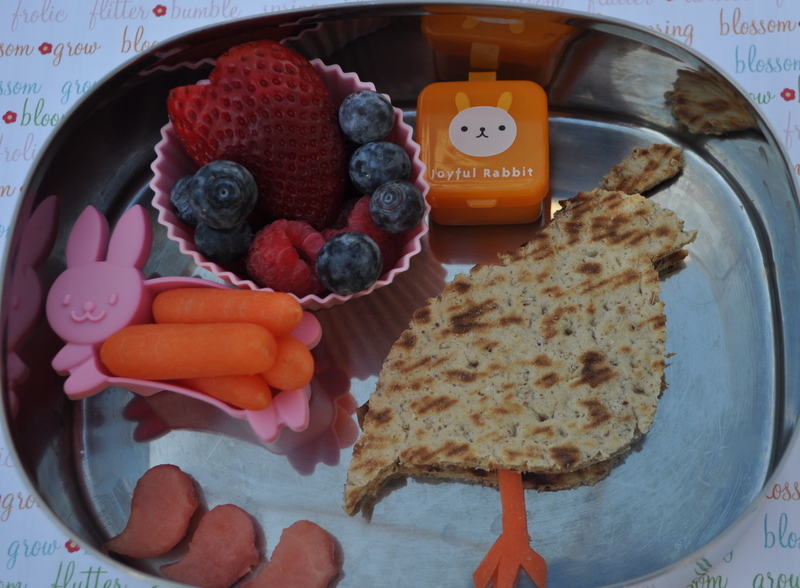 I started blogging about 11 months ago, and this was one of my first lunches that I made for little Miss G from my original cookie cutters. Please keep in mind that these are NOT vegan lunches, just ideas that can be replaced with other ideas. Also, I had a much worse camera then too! The two sandwiches were cookie cutters, and I’ll be were turkey & mozzarella if I had to guess. The flower is a piece of fruit leather cut with a fondant flower cutter. The mushrooms are biscuits with chocolate tops that I found at our local asian market. 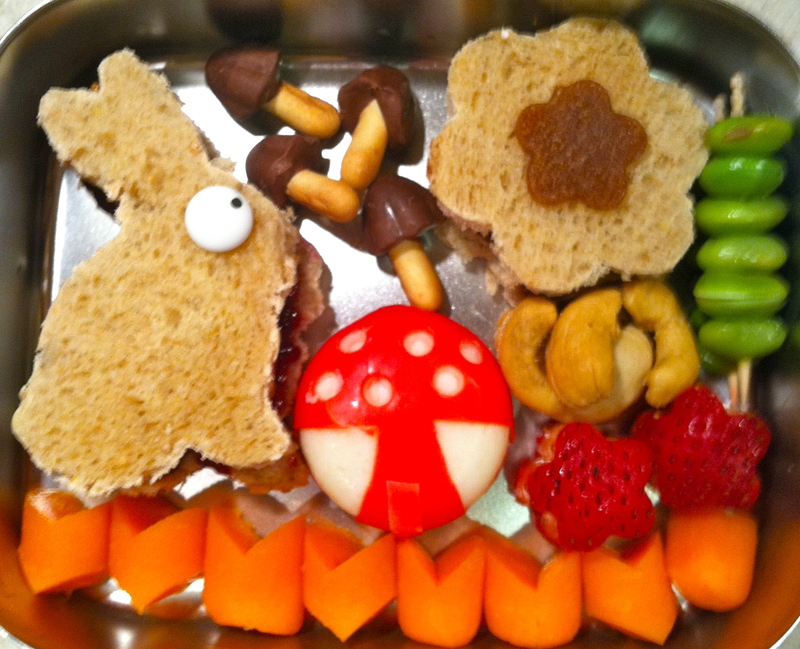 To the far right is a pick of edamame, cashews, strawberry flowers, carrots at the bottom, and in the middle is a BabyBel cheese with part of the wax removed to make a toadstool. 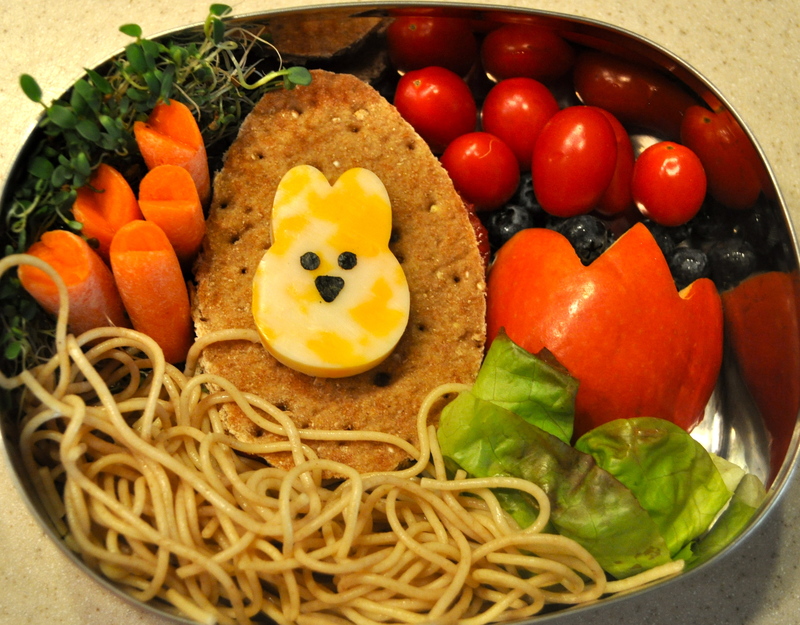 The lunch below was a whole wheat sandwich thin cut into an egg shape with colby jack cheese on top in a bunny shape nested in whole wheat pasta. The face was made of noir (seaweed paper) which my kids did NOT like. To the left are alfalfa sprouts, mini carrots. On the right are grape tomatoes, blueberries, an apple cut into a tulip shape and a piece of lettuce below that. 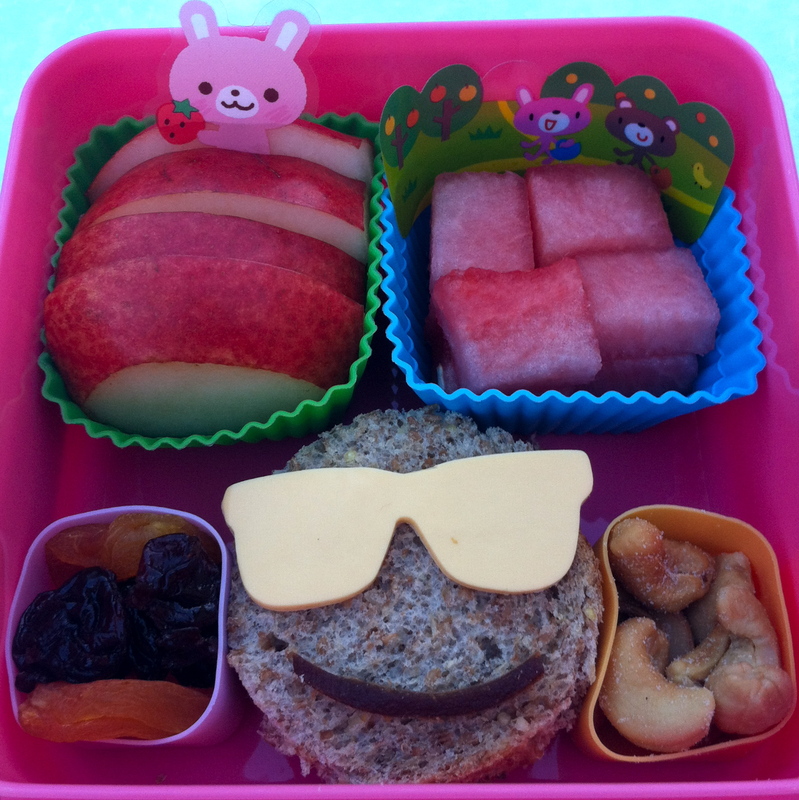 The last lunch is another bunny sandwich on whole wheat with a provolone cheese face. To the left are halved mini carrots, broccoli at the bottom, and on the right is a colby jack cheese carrot with alfalfa sprout top, cinnamon almonds, raspberries and a sliced kiwi. All 3 lunches were packed in a LunchBots stainless container. Well, not really, but this is the closest to eggs my kids are getting this year! It’s Easter week! Be sure to check out my post this Wednesday too. My blogger friends and I are doing a Bunny Hop so you can get dozens of ideas no matter what holiday you’re celebrating. Today’s lunch is egg themed. Miss G has a whole grain sandwich with almond butter & strawberry jam. On top is a strip of soy cheese with a few colored sprinkles. Above that is a pink plastic egg filled with dried cherries. 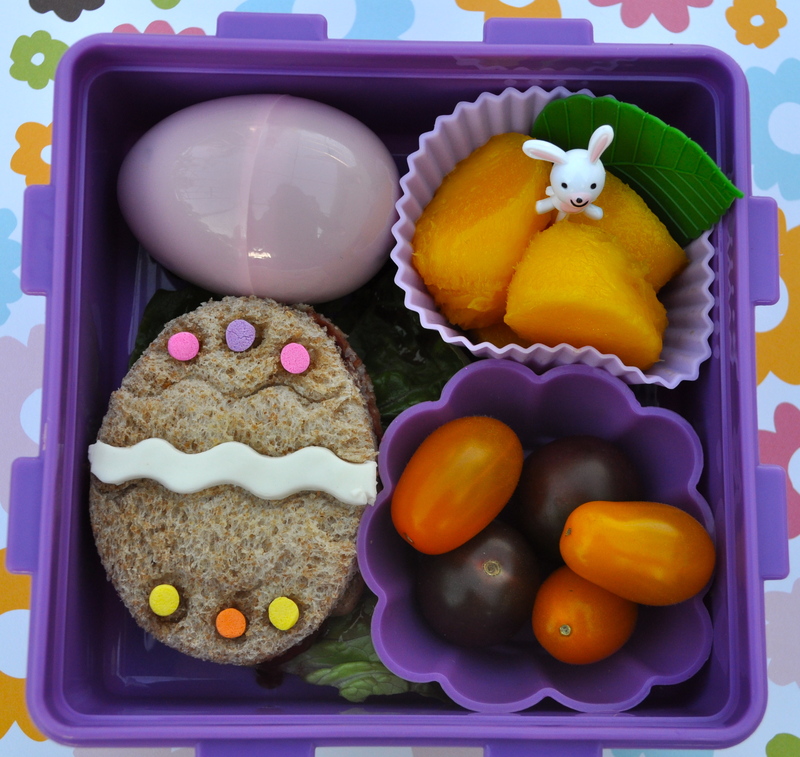 At the top right are egg shaped mango pieces with a bunny pick and at the bottom right are small purple and orange tomatoes. Miss A has the same sandwich as Gabby today with a soy cheese strip. Her dots are made from fruit leather and dried apricots. Above that in the pink bunny are dried cherries. At the top right are blueberries and an egg shaped dried apricot. 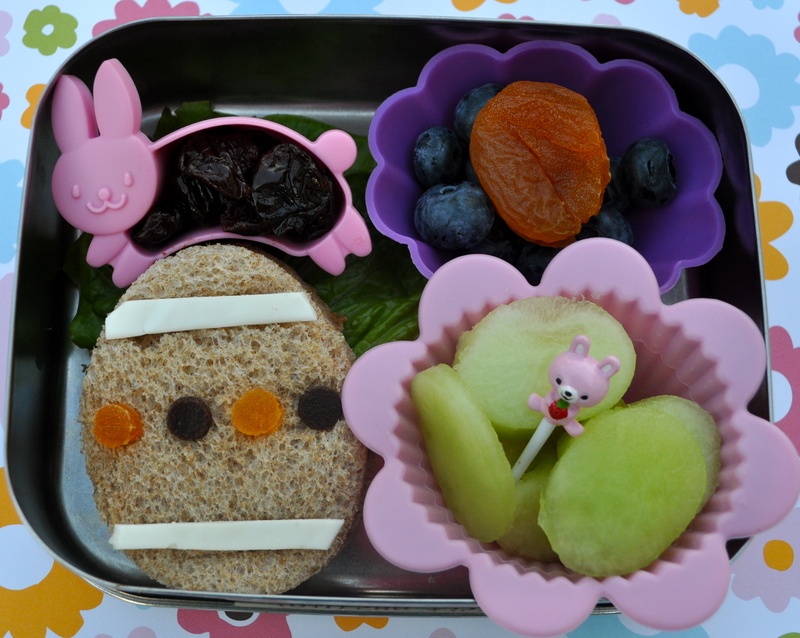 And in the pink flower are egg shaped honeydew melon pieces with a bunny pick. Both girls have ice water with their lunch. I know it’s WAY too early to be bringing out Easter already, but the kids found my Easter cookie cutter stash last night. It’s “R” week at school so rabbits it is. 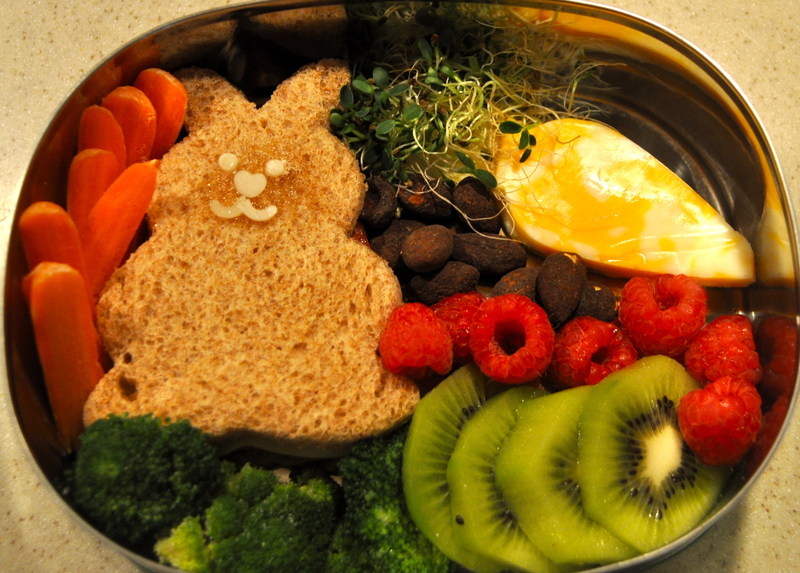 Miss G has a big earred rabbit with Veggy brand “cheese” for eyes and nose and the whiskers are fruit leather. The sandwich is almond butter & jam on whole grain bread. At the top right in the squished yellow bunny are cashews, below that are fresh plum slices topped with a prune that she didn’t finish for breakfast. 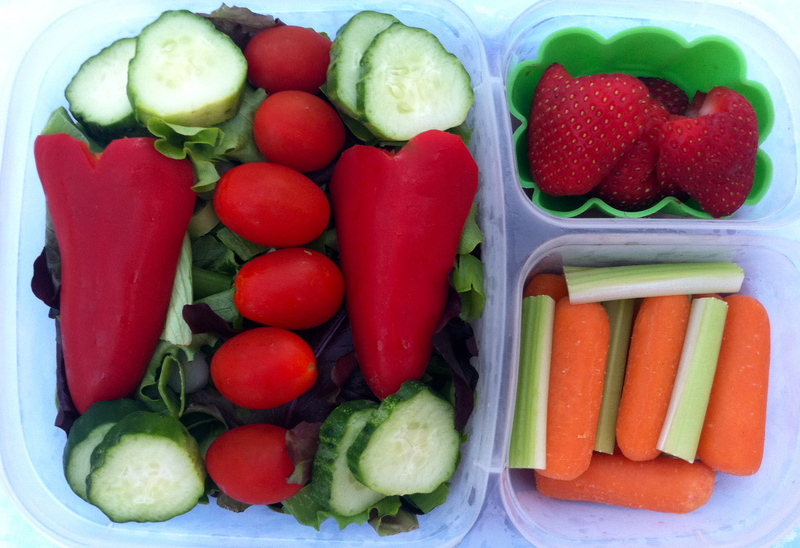 At the top left are watermelon rabbits and below that a few mini carrots. Today little A gets her own mini version of the R theme. The round rabbit sandwich and the letter R are both almond butter. One has fruit & the other a bit of agave nectar. 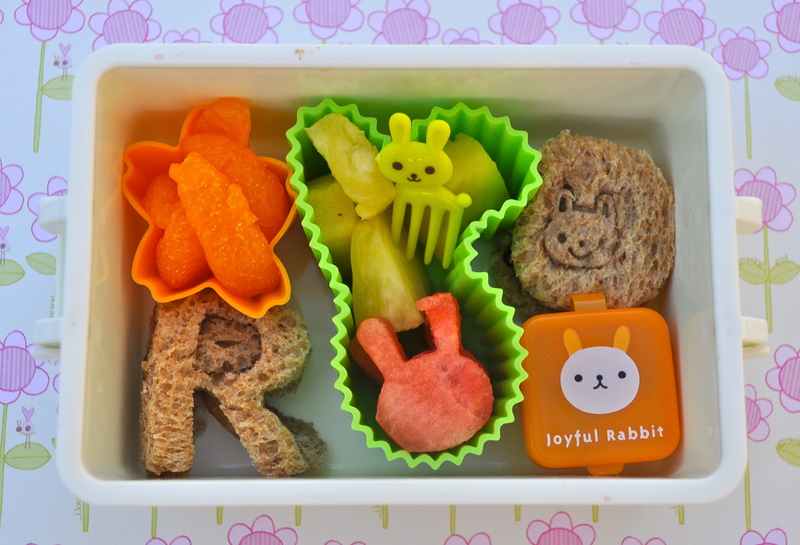 In the top left star are mandarin oranges, in the green rabbit cup are pineapple chunks and watermelon rabbits and in the orange rabbit container are cashews. Both girls have ice water with their lunches. I had all the right intentions. Last week was “P” week at the kids’ school. I thought I’d be proactive and ask Miss G what she wanted for her “Q” lunch. The only thing she could come up with was quail so it was decided. All good if NEXT week wasn’t “Q” week, and this week is a review. So much for planning! So a quail it is on whole grain flat bread with a carrot leg, almond butter & jam inside in a stainless LunchBots container. The 3 baby quails following behind are watermelon chunks. 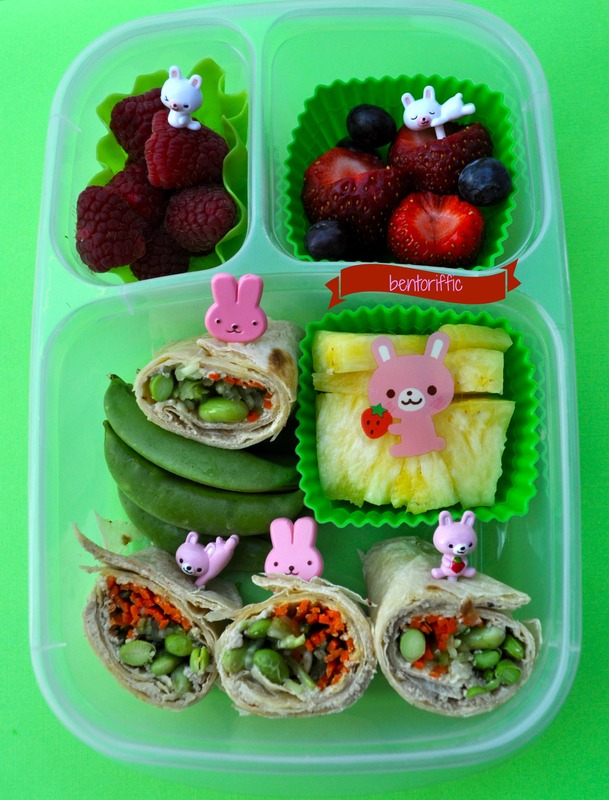 The pink bunny container has mini carrots, the orange sauce container has dip for the carrots and the pink muffin cup has raspberries, blueberries and a big strawberry. 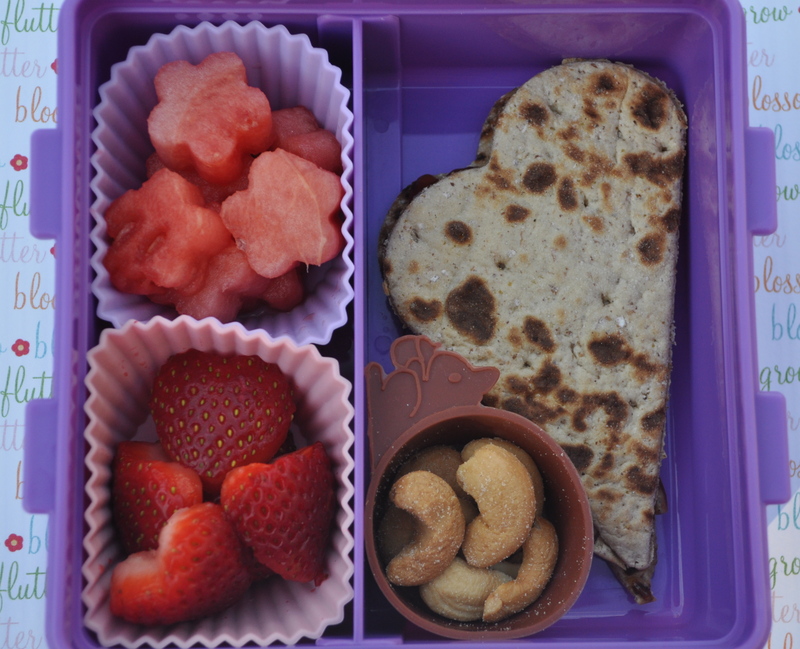 Miss A has a heart shaped flatbread sandwich with almond butter and jam. Underneath it in the squirrel cup are cashews. 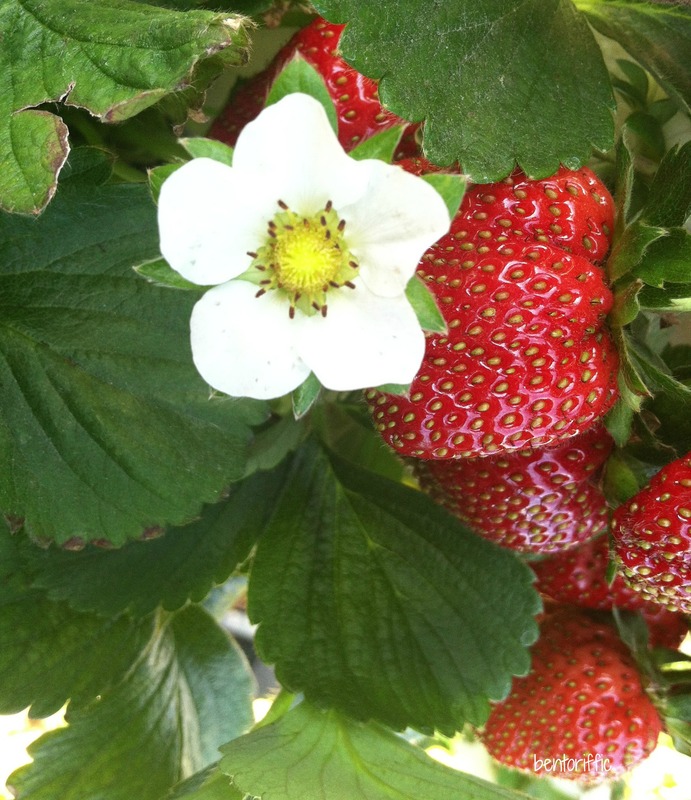 On the left side are watermelon flowers and heart shaped strawberries below. Both girls have ice water in their kids CamelBak water bottles. My kids aren’t normally in school Tuesdays, but my mother-in-law is visiting this week. Their school was kind enough to let me switch days so I could get a few things done at home. For the pip squeak, I decided on little bears. She loves Goodnight Moon and the 3 bears sitting on chairs. These are just PB & Js on whole grain bread. The faces are stamped out of fruit leather with my tiny face cutters. I used a tiny silicone bear to put her blueberries in. 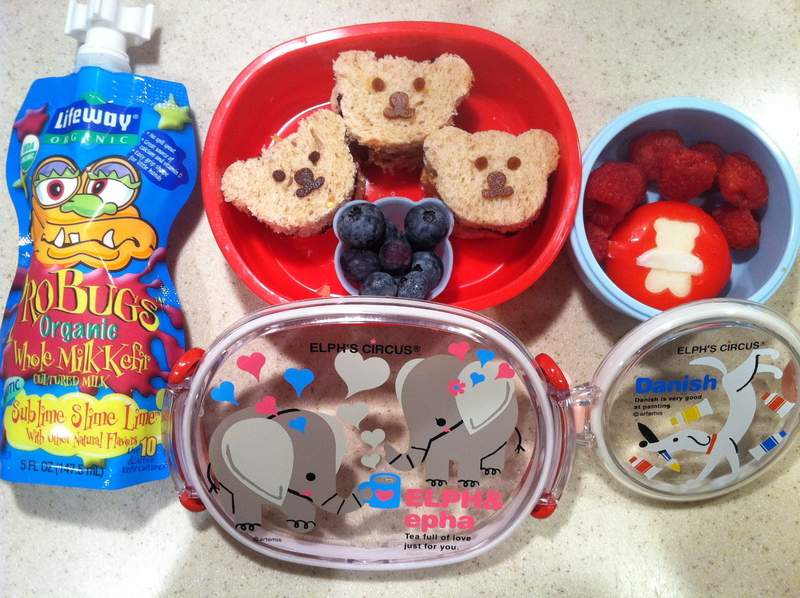 The separate smaller bento is raspberries and a Babybel cheese with a teddy bear stamped out of the wax. Both of the Elph & Epha bento containers are part of the new collection I bought from http://www.japanistic.com. 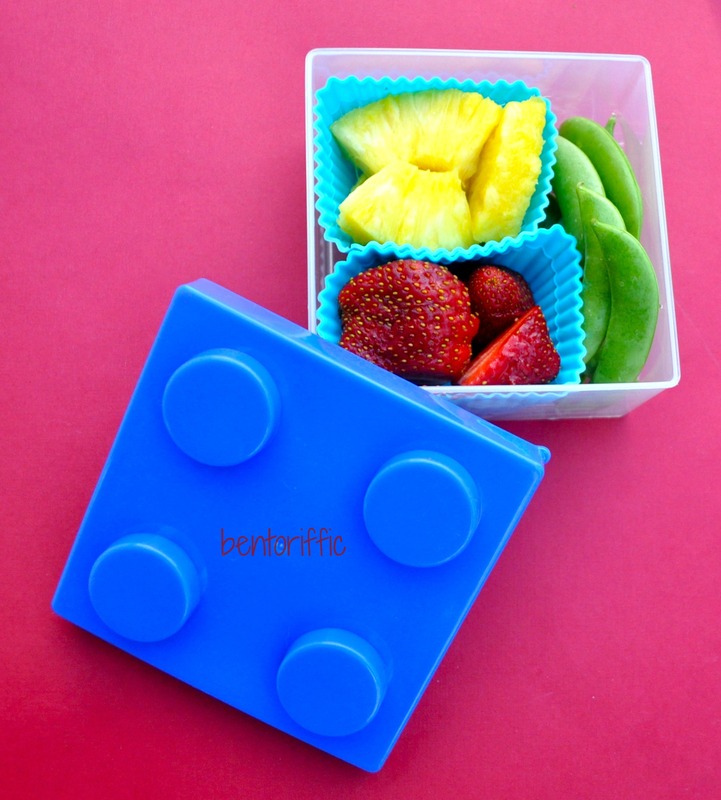 They are the perfect size for little lunches and snacks, and they are BPA free so no worry of leaching chemicals into food. I usually include a Lifeway kefir pouch for their daily probiotics and an ice water. Big sis wanted to help with her lunch today so it got a bit sloppy. 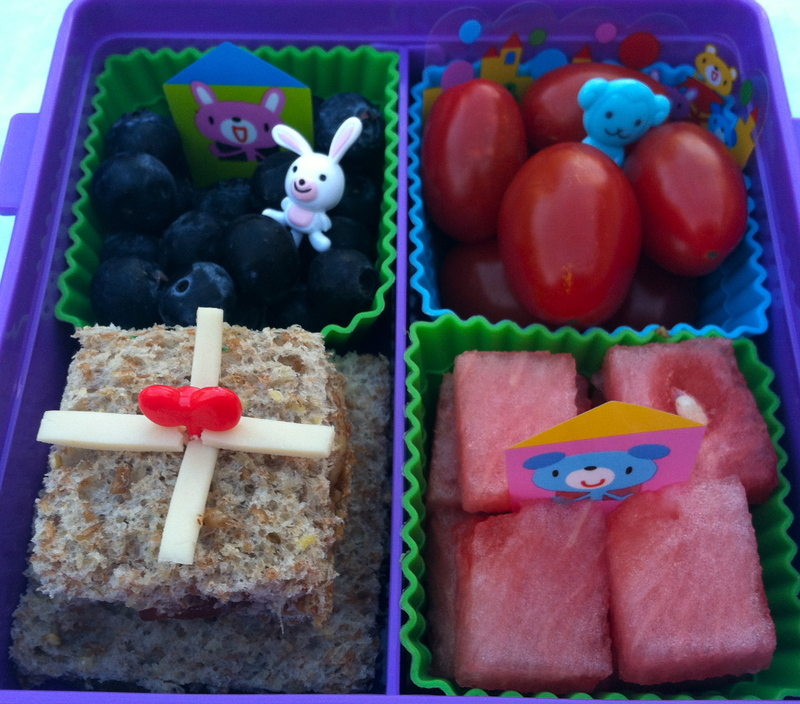 She wanted 3 bunnies sandwiches in her lunch. 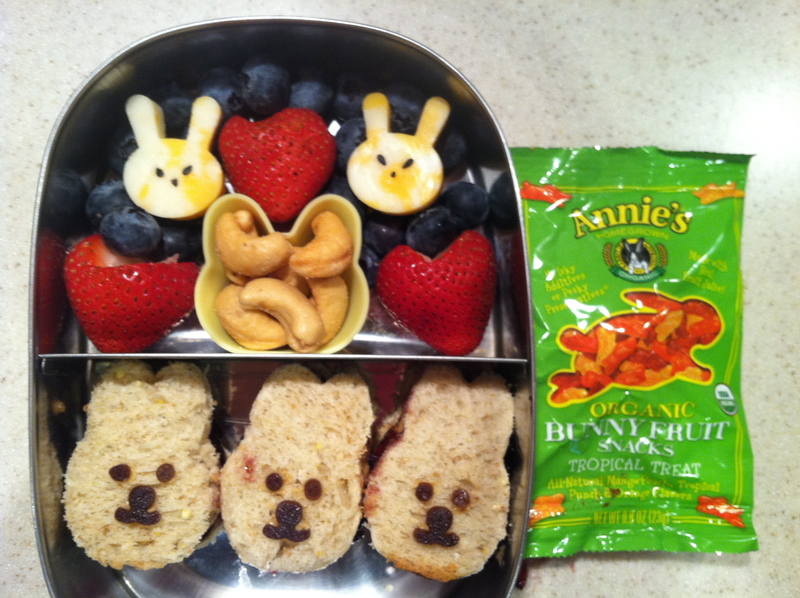 She also has PB & Js on whole grain with fruit leather faces, a packet of Annie’s organic fruit bunnies for dessert. 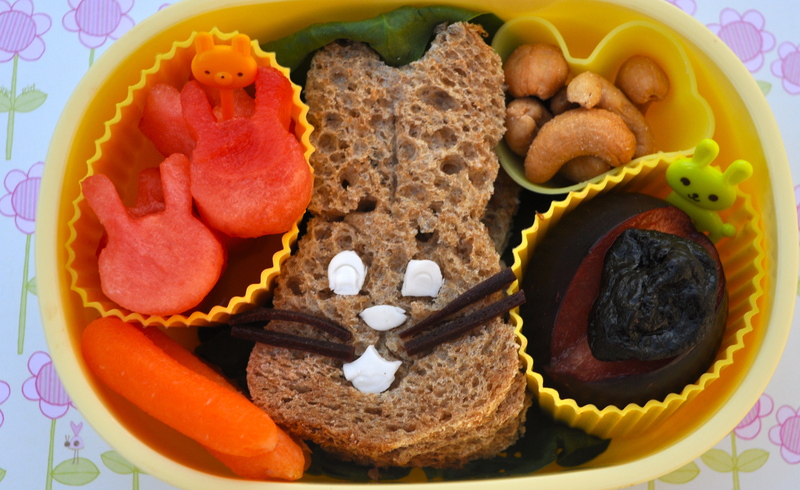 The top part of the LunchBots Duo bento is a silicone bunny container with cashews, organic strawberries & blueberries and colby jack bunnies with black sesame seed faces.